Now as soon as you will add ControlTemplate tag, you will notice that the content of the button is gone and button is shown as a transparent rectangle. This is happened because here I told WPF to replace the default ControlTemplate with the one, which I defined. But at this point, our ControlTemplate is blank, so there is no visualization and we can see only a transparent rectangle. Now we can see that, we get a visualization for a button in form of ellipse. At this point of time, it works OK, but there are scenarios where this struct breaks down. In above image, you will notice that button height is increased but the ellipse size is still the same, which is a bad UI design. And the reason this is happening is, inside a ControlTemplate, the height of an ellipse is hard coding. So, no matter, whatever height is set at parent (i.e. Button), it will not get inherited to child control (i.e. Ellipse). By setting the TargetType property of ControlTemplate, we are telling Ellipse that, any property of Button can be set to ellipse. Now, whatever the height of button will be, it will automatically be the height of ellipse also. Isn't it interesting? Moving forward, let's do something more interesting with Fill property of ellipse. 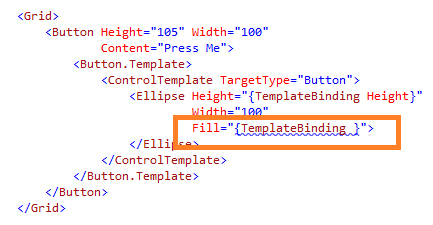 In above snippet, I am trying to set the Fill property of an ellipse using TemplateBinding. But now problem here is, a button doesn't have a Fill property. So, there is no one-to-one mapping for Fill property. Now, what to do ? In above image, you might have notice that as soon as ellipse's Fill property is set to Background, ellipse becomes transparent as button's background. Now if we set button's Background property to Red, the same will be applied to ellipse too. So, one can understand that how much magic we can do with TemplateBinding. Now, let's work little bit on code cleanup. So, now we can see as earlier that whatever visual property for button is set, all get applied to ellipse also. 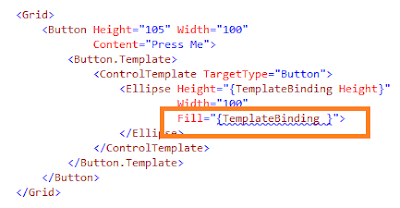 Hope this article was useful and gave you the basic idea on how to use TemplateBinding. "Questions about whether design is necessary or affordable are quite beside the point: Design is inevitable. The alternative to good design is bad design, not no design at all." "Design is the conscious effort to impose meaningful order"
So, if designing is that much important then one has to be very much stern about it. Going forward, today I am pointing out some design principles for Windows Phone App. So, let's gear up. Do spend time in branding your app - it includes logo, color, copyright info, etc. Images play a very significant role in any Windows Phone application. So, one should be very careful while dealing with images. As of now, Windows Phone supports only two image formats named JPG/JPEG and PNG. Now before concluding on which image format to choose, let's get into bit more depth of it. PNG format images are non-lossy and need very little CPU effort to display because those are pixel perfect. But at the same time, huge PNG images take too much longer to read from storage and ultimately lead to slower display. On the other hand, JPEG format images are lossy, smaller to store and based on the compression level much more complicated decoding algorithm is required to display them. Another point regarding image is about opacity and transparency - All the images that use transparency should be stored as PNG format because JPEG doesn’t support transparency and JPEG format should be used for all the images that are fully opaque. Now when coming to Windows Phone apps, performance matters a lot...Isn’t it? Choosing proper image format: Use JPEG for anything large and PNG for anything small, i.e. use PNG for small icons. If image transparency is not a concern then it is always recommended to use JPEG. Compiling images with Build Action=Content: Whenever a new image is added to the project, the default "Build Action" is set to Resource. It is always recommended to change this "Build Action" property to Content as it will reduce the size of our DLL, resulting in speedy image and app loading. Note: Resources are included in an assembly whereas content is included in deployment package. I'll keep updating this post as and when I'll get to know about more interesting facts. I would be very happy, if you can add more on to it.